The Prince of Wales Northern Heritage Centre (PWNHC) is honoured to showcase the work of Northwest Territories artist Abraham Anghik Ruben. Born in Paulatuk and having resided for a time in Yellowknife, we welcome Ruben back to the north for “Aurora Borealis” and join with him to celebrate his artistic success. Ruben’s work engages with several themes that are particularly relevant to us at the Northern Heritage Centre and in the Northwest Territories at large. The first of these is storytelling; Ruben uses a variety of mediums to illustrate stories about journeys, landscapes, waterways, goddesses and gods, and creatures both mythical and real. The second theme is cultural encounter and adaptation, which typifies the human history of the Northwest Territories and the wider Inuit experience across the arctic. Ruben’s own individual and family history is woven through his work. While primarily of Inuvialuit identity, his ancestors also included people of Yup’ik descent and European whalers. From this personal and cultural point of reference, Ruben expands his stories to include those of the Norse cultures who interacted with Inuit ancestors throughout the arctic hundreds of years ago. Ruben’s work shows us the unexpected connections between geographically separated peoples and tells stories of shared humanity. Today in Canada’s north, interaction and collaboration between people of different cultures continues to be central to northern society. Ruben’s historical narratives will surely resonate with today’s multicultural northern communities. The source material for Ruben’s sculptural work is derived not only from Inuvialuit oral history and personal experience, but also from Norse sagas, and scientific research such as archaeology. Thus Ruben shows us how history and research can be woven together through art and demonstrates the value of layering scientific and cultural perspectives as we do in our work at the PWNHC. Visitors to the Northern Heritage Centre may be familiar with “Children of the Light” (1979), an early piece of Ruben’s that has been on permanent display since our building was opened. We have six additional artworks in our collection, some of which you will see in the show and in this catalogue. We are delighted to be able to see some of his more recent work in 2015 and to share it with our visitors. Kipling Gallery is honoured to feature the sculpture of Abraham Anghik Ruben at the Prince of Whales Heritage Centre. This exhibition, entitled “Aurora Borealis: Abraham Anghik Ruben”, marks Abraham’s return to Yellowknife after a forty-year absence. I would like to express my deepest gratitude to Cosimo Stifani for his patience and countless hours of discussions and his creative input into the naming of this important exhibition, “Aurora Borealis.” The rationale explains Cosimo: “Aurora Borealis is the Latin name for northern lights and Aurora is the goddess of dawn in Roman mythology. 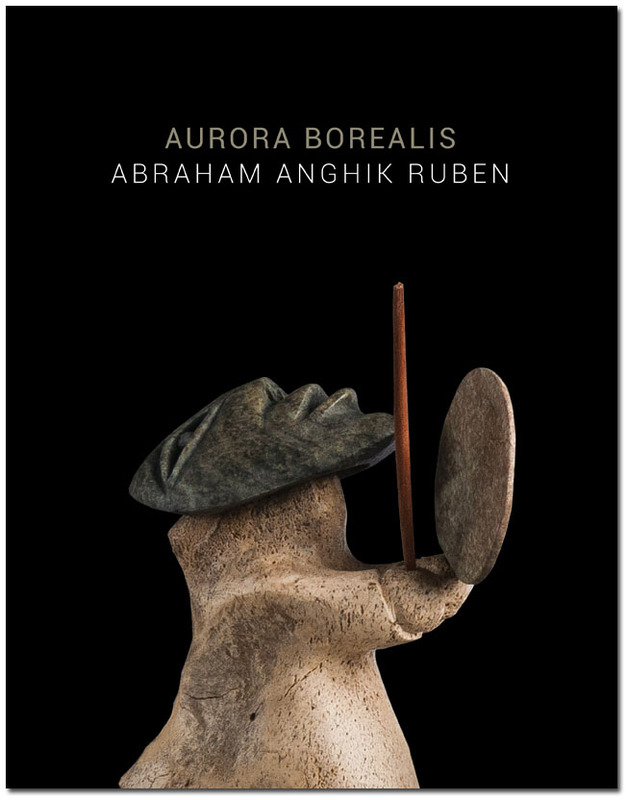 By having, the artist’s name as a subtitle, we tie the dawn of an artist to a seminal and enlightening artistic event.” Abraham’s masterful work transcends the sculptural boundaries of what is normally considered traditional Inuit art. His sculpting technique and interpretive storytelling is much more intricate and sophisticated than any contemporary artist today. The works in this exhibition not only represent Abraham’s interpretation of the many stories, myths, and legends that he is inspired to depict in stone, bone, ivory and bronze; it also illustrates how competent the artist is at manipulating his media. A superlative level of technical execution is required to penetrate such hard surfaces and breathe tangible life into the pieces he creates and thus the stories he relates. Abraham’s real ingenuity lies in his ability to transform natural raw material into such detailed and exquisite sculptures. I believe that the oral tradition of his Inuit background coupled with his formal art education at the University of Alaska, Fairbanks, enables him to develop a clear understanding of design that helps to facilitate these interpretations. When viewing the exhibition, you must engage in an intellectual exercise by philosophically examining how both form and concept are expressed in this artist’s interpretations of his subject matter. Examine the subtle nuances illustrated in each subject, the skilful workmanship and the sophisticated design that only Abraham can achieve. His creations are an embodiment of powerful beauty that spark deep, contemplative reflection. I am grateful to Sarah Carr-Locke and Janna Graham at the Prince of Wales Heritage Centre for hosting this exhibition. I am also indebted to the collectors for their generosity in sharing their sculptures. Finally, this exhibition could never have been developed without the dedication and indefatigable commitment of the artist, Abraham Anghik Ruben. It is difficult for many of us to realize the accomplished artistry required to create such masterful work. We admire the iconic art of the ancient Greeks and Romans, the masters of the Renaissance, the countless artists of the twentieth century. We should also extol and appreciate the quality and significance of the subtle and elaborate design implications Abraham employs to convey different perspectives and interpretations of his subject matter. It is time that we applaud the spirit and workmanship of this consummate contemporary Canadian artist, Abraham Anghik Ruben.